The Story of Ireland RTE Fergal Keane OBE. History myths? Irish Forums Message Discussion :: The Story of Ireland RTE Fergal Keane OBE. History myths? Irish Forums :: The Irish Message Forums- Sceala Irish Craic Forum- The Story of Ireland RTE Fergal Keane OBE. History myths? Sceala Irish Craic Forum Discussion: The Story of Ireland RTE Fergal Keane OBE. History myths? RTE and BBC have supposedly joined together to produce a new tv history of Ireland. RTE have promoted this new history of Ireland TV as myth busting. RTE inform us that Fergal Keane OBE (Order of the British Empire) -is just the man to enlighten us all to our foolish ways and ignorance. RTE informs us that Keane OBE is going to debunk Irish myths on our behalf. Everything culturally distinct Irish, or anything thought ancient and Irish is (according to Keane OBE) not really Irish at all, but a complex hybrid. Strange then! That Fergal Keane (and all of his chosen supposed historians) do not have any such scrutiny for the English or British. Keane is eager to use both these terms in any simplistic extreme, even when centuries out of any credible historical context. For example. Keane and selected crew, refer to French speaking Cambro Normans as English. The flavor of Fergal Keane's OBE, history of Ireland, can be fairly summarized in one extremely simple but telling supposed history moment, presented as supposed insight into the truth. Keane OBE visits his old School Teacher in Cork. In smug conversation with pupil Keane, we witness the odd couple effectively patting each other on the back, for they are of the gallant few, guardians of the truth. Keane's former school teacher, informs the viewer how he set his pupils the essay with the title. When a pupil cried, "Sir how can Edward Carson the British loyalist be a Irish patriot"
The Teacher then relates to star pupil Keane, how he managed to convince most (if sadly not all) of the group of children, with this simple reply. Clearly Teacher remains so self satisfied to this day with this supposed genius insight. That Carson only wanted what was best for Ireland. The pupils, in Teachers opinion - could no longer be able to say Carson. was not a Irish patriot. Simple as that. What great thinking, true genius. Oh no wait. What this proposed genius insightful teacher actually said was non sense, and was certainly not some overlooked historical reality or insight, what so ever. Idi Amin is rewritten to a Ugandan patriot. Osama Bin Laden a pan Arab - pan Islam Patriot. Sure did they not likewise only want what they thought or claimed was best. Using Keane OBE history teachers logic, every thug & bully who has ever threatened or used terror is a patriot. According to the logic of Keane OBE by default of his old teacher. Every terrorist leader who defies democracy, who violently resists the wishes of the majority, is just a misunderstood patriot. What utter nonsense this selective grand idea is in reality, literally pathetic. If that is the standard of teaching history and applied logic, then it is no wonder most in Ireland are so ignorant & uninterested of their own history. Carson as leader of a small minority that armed itself and threatened violence against the majority, against democracy, was the epitome of a terrorist. Carson was specifically a role model for other Colonial terrorists who did not want to share with natives, that is the real history. No matter the selective revisionist nonsense. wonder in words that hid his blatant british unionist bias. that the rebel leaders and some of the killers were protestant united Irishmen. He would leave all that out though, would not OBE HE! the fact that the crown had purposely set out to create sectarian divide to prevent the loss of their Irish colony and massive profits gained from theft and taxing same. Keane only wanted to tell the only story in town just as it was hoped and told by crown story tellers all those centuries ago. Facts left out by Keane OBE left outpurposely as they would contradict the message he wanted to impart! 25 May 1798 Massacre of Dunlavin Green Dunlavin, County Wicklow 36 Massacre of rebel prisoners by Crown loyalist militia. 25 May 1798 Carnew massacre Carnew, County Wicklow 38 Massacre of rebel prisoners by Crown loyalist militia. 19 May 1798 Gibbet Rath massacre Curragh, County Kildare 300�500 Massacre of rebel prisoners by Crown loyalist militia. Even on the eve of Scullabogue the british crown army had been burning surrendered people alive in the town of Wexford, almost certainly a direct factor if not cause of vengeance at scullabogue of known or suspected loyalists (including catholics)! "Survivors who had fled the fighting had reached Scullabogue with news of the terrible losses while the battle still raged violently. News was also brought of a massacre by soldiers of 70 rebels trapped in the town who were burned alive and whose screams were reported to be audible above the din of battle by a loyalist witness, James Alexander"
but hey Keane OBE left all that out and so did dr foster! Left out because they know it would not show their loyal crown as good guys or impartial. it would in fact highlight that the crown was perverse, had purposely set out to cause sectarian divisions. Hence keane bleated out the scullabogue story and told it in the centuries old crown loyalist fashion as if it occurred as the only massacre, occuring organically and naturally because of the Irish, and only because of their religious divide! If keane had of told the full story, any of the above or how for another example how the orange order was designed if not created in this period of history, encouraged and financed by the crown, and were doing this specifically to cause simplistic sectarian division in Ireland. the crown had lost America and they were determined not to lose Ireland by what ever means or evil. Bloody british state crown lies, all those years of state crafted bloody lies, people looking to know the full story everywhere would cry if Keane actually did his job! If Foster was actually a unbias historian! those facts aside which tell a different history to keane obe story! Keane obe version is quite simply a low life purposely simplistic british coin glistorian version. Of course simple theory is not the whole story, because Fergal Keane OBE, does not automatically think so simply, or accept any old story without question - No! This so called history is a Queens man story. Fergal Keane OBE only thinks that simple way when it suits his agenda. A pro British agenda. Like all keen revisionists seeking information that matches their bias, Keane OBE is selective. Revisionists, especially the pro British version of the History of Ireland revisionists, only do Simple when it suits. Simple claims -research light, only becomes obvious fact, when it matches their preordained conclusions. The Story Of Ireland RTE BBC presented by Fergal Keane OBE. Will it really be myth busting as promoted - or yet another British inspired revisionist history of Ireland. Revisionism with purpose - to promote the conclusion of Britain as a misunderstood benefactor - and Irish resistance to British terror, colonialism and empire - as irrational violent - corrupted and ignorant. We should expect to view all the many English attempts at genocide of the native population of Ireland - placed in some context, one that begs us to understand British terrorism - as not really terrorism. From Fergal Keane OBE record to date - we can expect no such understanding through context for the Irish - for anyone who tried to physically resist British terror. This Story Of Ireland has all the ingredients of a BBC- British crafted pro Union work that RTE have bought into. Fergal Keane OBE the presenter - a pro-unionist BBC journalist who has made his biased and pro-union views well known by chance or design. In this link for example in 2001 -the so called Irishman - Fergal Keane OBE, profess too much his incorrect usage of Ulster - more befitting a semi-literate drum and lager loyalist, than impartial thoughtful journalist. Irish Myths - but not any of the many more British myths - have clearly kept Keane OBE awake at night for several years. In 2001 salaried by the BBC - Keane was busy making myths himself. With careful craft - Keane starts off his debunking of myths with what appears to be some reasoning, a sense of equity to reach fair conclusion - before reverting comfortably into his one sided pro British view of targeting only Irish myths. Fergal Keane OBE has bias and a distant view of Irish events - clearly holds views as shameful as those he often attempts to demean as simplistic and extreme. * The BBC hired a writer with no great historical pedigree - a Trinity College graduate - to write their script. When the BBC - a integral part of the British establishment, who promote a British view of the world - chose Trinity College - they chose well. Trinity College Dublin that most ancient of anti Irish and pro English Union institutions. A Institution that has produced a number of quite shameless so called historians. Such as the revisionist so called myth busting Foster - more British than the British than credibly a impartial historian. The BBC - not RTE - specifically searched out Trinity to hire a suitable scriptwriter. With no unique historical research to be credibly acclaimed. Written by a Trinity College writer with no great historical pedigree - as directed by a OBE and the BBC. This story of Ireland is not likely to be any credible or genuine attempt to understand and communicate the history of Ireland. Not a history of Ireland from any new and different angle, or enlightened perspective. Regrettably - the ingredients of Keane OBE history of Ireland are ready made for bias. Just another Irish history based upon well worn British bias and wishful thinking - Simplistic assumptions of the past, where England is ancient and the centre of the world. A trailer has Keane referring to Normans as Anglo Normans and English. Such obvious historical inaccuracies raises serious questions to Keane's motives - if not his intellect. Did Keane OBE or the Trinity script writer, ever wonder around the real identification of the French speaking Normans based in Wales, on the mercenary commission of a French speaking King based in France. Was Keane ever once at any time in his life - curious enough to investigate if a identifiable English race or English language actually existed at the time of the Norman invasion of Ireland? This story Of Ireland has all the ingredients in place to be a typical pro British-pro union view of Irish history and culture. Nothing new, so why now? Fergal Keane OBE story Of Ireland is being shown now, for more reason than curiosity or academia. This Story Of Ireland presented by a OBE is most likely being aired now for specific reason. 1. To demean and dilute a distinct Irish identity- confuse Irish nationalism - in order to promote and encourage a more accommodating climate for the visit of the British Queen Elizabeth 11 - planned for this year. This is almost certainly the reason for this revised history lesson now. 2. Another attempt to further promote the dual -and ironically conflicting notions - of a sketchy - non-specific Irish identity, at the same time as a distinct pure Protestant Ulster identity. Fergal Keane OBE will carry on what the British under Thatcher termed the Ulsterization and criminalization of what they called the Irish problem. Expect Fergal Keane OBE to Impress at every opportunity - the problems of Ireland being rooted in a rather unfortunate religious divide. Keane will structure his simplistic bias, add some words to portray to the ignorant, his supposed intellectual historical reflection. Bias Keane OBE, will still be suggesting that - if it was not for Catholics, then Ireland could be mature, as one with the great and enlightened UK and empire, that Keane so obviously is proud to serve. Do not expect from Keane OBE the plain stark and obvious truth. Ireland's problems are not rooted in Religion, the problems all stem from foreign colonization, from England and the purposeful divisions of the native Irish population. Divide and conquer was the aim before a Protestant existed. Divisions continuously created by London to keep their stolen land and power in Ireland. 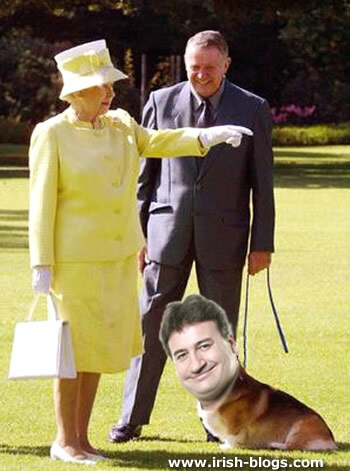 Fergal Keane OBE will not keep impressing this basic truth and shame his British Queen that he bows before. Do not expect Keane to inform us how the UK set out to destroy the Republic and the Irish, how London stole all the bullion in the Irish banks, valued at least 100 billion today. Keane will do what all good BBC journalists have done, tell the story of the Irish problem simply, to suit a ignorant British audience. The BBC have a history - they led the propaganda broadcasts on behalf of Conservative Governments - the BBC did their very best to portray the six counties as natural, a distinct nation. Naming the separated six counties of Ireland - Ulster - as often as they could, was no careless oversight. The BBC purposely promoted ignorance - provided credibility to sectarian and racial extremists like Dr No Paisley. The link above from 2001 shows that - Fergal Keane OBE was a most willing servant of the Ulsterization and criminalization campaign. If this program proves to be impartial - no stressing of Ulster being six counties for classic example, then we can congratulate the BBC for a first for them on the subject of Ireland and Irish history. And of course Fergal Keane Order Of the British Empire. Details of the The Story of Ireland - a groundbreaking new series presented by Fergal Keane about the history of Ireland - cultural, social, and economic, and its role on the international stage. The Story Of Ireland is a five-part landmark history of Ireland, to be presented by Fergal Keane. Ireland is living through a significant period in its cycle of history - since the 1998 Good Friday Agreement, the island has been at peace. This is unprecedented in the history of modern Ireland and so seems like a perfect time to reflect on the Irish as a people now, as a modern European nation, and how we got to this place. The big ambition of this telling of the story is that it should be expansive and outward looking. When the previous television history series was told by the historian Robert Kee in 1981, Ireland was in a very different place, at war with itself in the north and economically ravaged in the south. The series naturally reflected those conditions and primarily viewed our story through the prism of our troubled relationship with our nearest neighbour. This series will show us that this view is narrow and self - limiting. The Story of Ireland will look at the evolution of the country in a world context and will show that as an island people our very DNA has been formed by successive waves of peoples coming from outside and that we in turn have travelled and influenced world events for nearly 2000 years. As a BBC foreign correspondent, Fergal Keane has nurtured a world view of current affairs and history for over 20 years and will act as a knowing and trustful guide for this new Story of Ireland. The story of Ireland is vivid, exciting and immensely varied. It is far more than the sum of old cliches and myths which set the Irish as a people who were prisoners and victims of history. This series sees Ireland as an international island which is both changed by and helps to change the world beyond her shores. As a foreign correspondent who has traveled on every continent I have tried to bring my experience of the wider world to this story of Ireland and. I have tried to see our past with a clear eye and an open heart. The opening idea and theme for the whole series is best surmised as follows: This is not the story of Ireland as John Bull's 'other' island, nor is it a romanticised vision of Ireland as a place apart, a wild land on the furthest flung corner of Europe. Instead the series aims to explore Irish history on its own terms, using the historical facts and evidence while charting the origin and impact of the numerous myths that have been passed off as history in the past. Key to this approach is relating developments in Ireland to events and changes in Europe and the world at large as the centuries progress. Major areas discussed in the opening episode include the origins of the idea of a 'Celtic' race, apart from the main; the impact of early Christianity and monasticism in Ireland; the birth of Ireland's potent literary culture; the unique law tracts created by Irish lawyers that afford us remarkable insights into the day to day lives and habits of ordinary people nearly 1500 years ago. The Vikings are treated not simply as barbarous marauders, but resourceful settlers (as the Celts were before them) who established Ireland's major towns and placed them at the centre of a vast trading network. Brian Boru comes to us as a man of his time - above all else motivated by the will to power. Far from driving the Vikings out of Ireland he relied on their military skills to achieve his ambitions. And so come the English, with their giant war horses, lethal archers and shimmering impenetrable armour. Thus begins 800 years of Irish subjugation to their brutal neighbours from across the Irish Sea. Or maybe not. This episode gets under the skin of the Anglo-Norman invasion of Ireland, and relates it to the huge upheavals and changes taking place across Europe at the time. We hear the Norman view on Ireland through the pen of Gerald of Wales - chronicler, propagandist, author of fantastical lies and at other times poignant, moving passages on Irish music and the handsomeness of its people. A truly fascinating lens through which to view the invaders' opinions of the Irish. The impact of the Normans on Ireland's landscape was immense at first; but the structural frailties of the expansion and subsequent Gaelic Revival in the mid fourteenth century challenge traditional views that the Irish merely gave in to the settlers. Gaelic culture and life in fact proved remarkably resilient. The Tudors centralised power in fits and starts - but Elizabeth I was forced to deal with Ireland head on. External factors propelled this - a Protestant queen far from secure on her throne, Ireland's potential as a back door to England for hostile powers was the catalyst for much of the action in the Elizabethan Age. We see canny Irish leaders horse trading with the European superpowers, Spain and Rome. The emergence of major secular divides is brought to light in this era, as is the destruction of an old Gaelic order in the wake of Kinsale. Spanning the Ulster Plantation to the Act of Union, this is an era that sees Ireland take centre stage in a much wider European conflict. It is also a period rife with bloody events still raw in the 'memories' of many Irish people, both catholic and protestant. Vital to this episode is a measured, factually driven approach to the more controversial moments and characters, to hold up the truth of events as they happened, their impact, and in doing so blow away some of the myths that have built up around them. Portadown, Cromwell, the Boyne, penal laws and land resettlements are all major areas for exploration, and all will be set in wider contexts than has traditionally been afforded them. Attention will also be given to the 18th Century boom time Dublin especially - an economic, intellectual, architectural and cultural flowering that is often overlooked. In contrast, we will also investigate Gaelic life and culture during the eighteenth century. Through poetry, music and the rise of a catholic middle class we will see the story in a more complex light than simply rich ascendancy minority on one side, poor Catholic majority on the other. The story of Wolfe Tone and the United Irishmen is vividly brought to life with extensive specially shot material in Paris, again pulling the Irish story into the broader history of Europe, in this instance revolutionary France and the cry of Libert�, �galit�, Fraternit� that resonated so strongly with Tone and his fellow reformers back in Ireland. The severity of the sectarian divides and violence in Ireland in the wake of the failed French landing however shock Tone, he realizes, as so many would after him, how much more complex the Irish situation is than even he'd ever dared to imagine. Fergal Keane's Story of Ireland explores the great changes of the 19th century. Starting with the 1801 Act of Union, when Ireland becomes part of the United Kingdom for the first time; Keane shows us how modern Ireland comes into being through the great constitutional battles for Catholic Emancipation, Land Reform and Home Rule. We also witness the horrors of the potato famine of the 1840s.